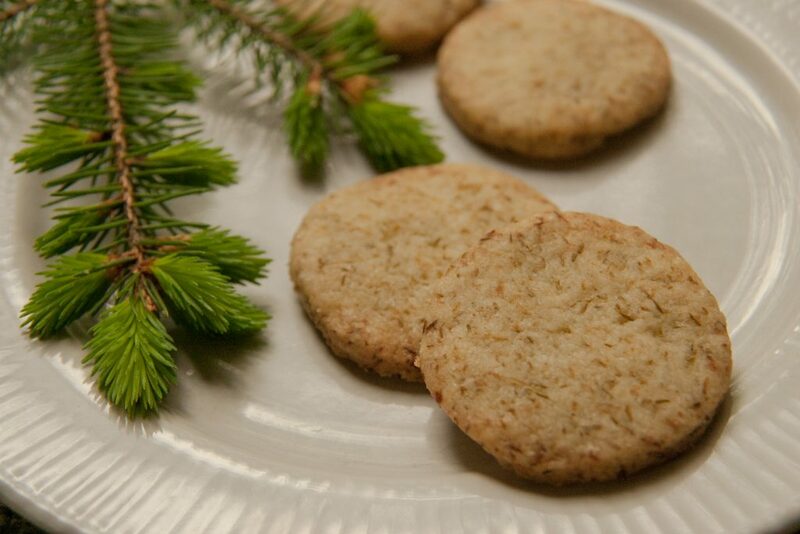 Spruce tip shortbread cookies make a great holiday treat. There’s no reason not to make these cookies year ’round, but I think there’s something especially wintery about evergreens, don’t you? You’ll be surprised by the bright, almost lemony flavor spruce tips add to this cookie. It’s the perfect counterbalance to the rich, buttery shortbread. Many evergreens have edible parts, including pine, spruce, fir, and hemlock. If spruce doesn’t grow near you, substitute one of these other evergreens. When I first started cooking with spruce, I used only the soft, young tips, which are available in spring. I still prefer the tips for some things, like infusing spirits and cream, but I’ve also played with more mature spruce needles and I like their flavor, too. This cookie recipe works well with either young tips, mature first year growth (which is available year round), or a combination of both. Finely chop the spruce tips in a food processor. Use a spatula to wipe down the inside of the food processor bowl, then add the sugar and pulse to combine. Add the flour, salt, and butter, and pulse until the dough looks crumbly. Remove the dough from the bowl and roll it into a ball. Cover in plastic wrap (or seal in a plastic container) and refrigerate for at least a half hour. Flour your cutting board or counter top, and roll out the dough to between 1/8 and 1/4 inch thick. Cut the dough into your preferred cookie shape. Since shortbreads are rich cookies I keep them on the small side, and use a glass to cut circles about two inches in diameter. Lining your cookie sheet with parchment paper is especially helpful with shortbread cookies. Because they’re so buttery, they can be messy to clean up, and the paper helps with this. It also keeps the cookies from sticking, and most importantly, prevents the cookies from getting too brown. Shortbreads don’t expand much when they bake; place these approximately one inch apart from each other on the baking sheet. Bake for 20 minutes and if they’re not quite golden enough, add a few minutes more. You probably won’t need more than 25 minutes and you definitely don’t want to over-bake the shortbread. Spruce tips have a delicate flavor and over-baking will obscure the spruce tip taste. Let the cookies cool. While many cookies are delicious warm out of the oven, shortbreads are one of the few cookies that taste better when they’re cool. The lemony flavor of the spruce tips comes across more fully in a cool cookie. It’s a sophisticated flavor, just perfect for afternoon tea. Have you made these with frozen tips? I have, Alan, works great!